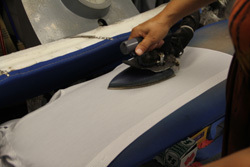 Fabric Cleaning is how Lansing Cleaners got its start back in 1946 and it's at the heart of everything that we do. When it comes to your fine garments and fabrics, you can trust the experts at Lansing Cleaners. Whether it's your favorite cotton shirt, a St. John knit, Armani suit or leather jacket, Lansing Cleaners will clean, inspect and finish it for you. Call or contact us today with any questions about fabric cleaning or to arrange for free pickup and delivery, 708-474-2459.